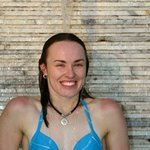 Martina Hingis (pronounced: hing-GISS) (born September 30, 1980 in Košice, Czechoslovakia, now Slovakia) is a former world number one Swiss tennis player. 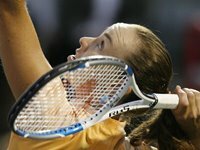 Known as the "Swiss Miss," she has won five Grand Slam singles titles (three Australian Open, one Wimbledon, and one US Open). She has also won nine Grand Slam women's doubles titles, winning a calendar year Grand Slam in 1998, and one Grand Slam mixed doubles title. She spent a total of 209 weeks as World No. 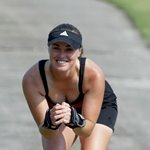 1 and set a series of "youngest-ever" records before ligament injuries in both ankles forced her to withdraw from professional tennis at the relatively early age of 22. 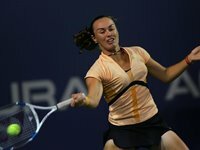 On November 29, 2005, after several surgeries and long recuperations, the 25-year-old Hingis announced that she would return to the WTA tour, starting her professional comeback at a low-key tournament in Gold Coast, Australia in January 2006. 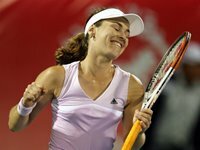 Since then, Hingis has climbed to No. 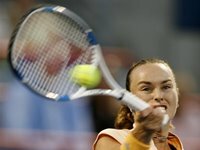 6 in the world rankings, won three titles (at the Tier I tournament in Rome, the Tier III tournament in Kolkata, India, and the Tier I tournament in Tokyo), was the runner-up in three tournaments (Tier I tournaments in Tokyo and Montreal and the Tier III in Gold Coast), and qualified for the 2006 WTA Tour Championships in Madrid. 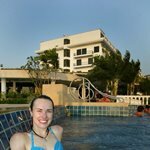 She is currently engaged to fellow tennis player Radek Štěpánek. She has been coached by former Czech professional and mother, Melanie Molitor. However, she currently does not have a coach.